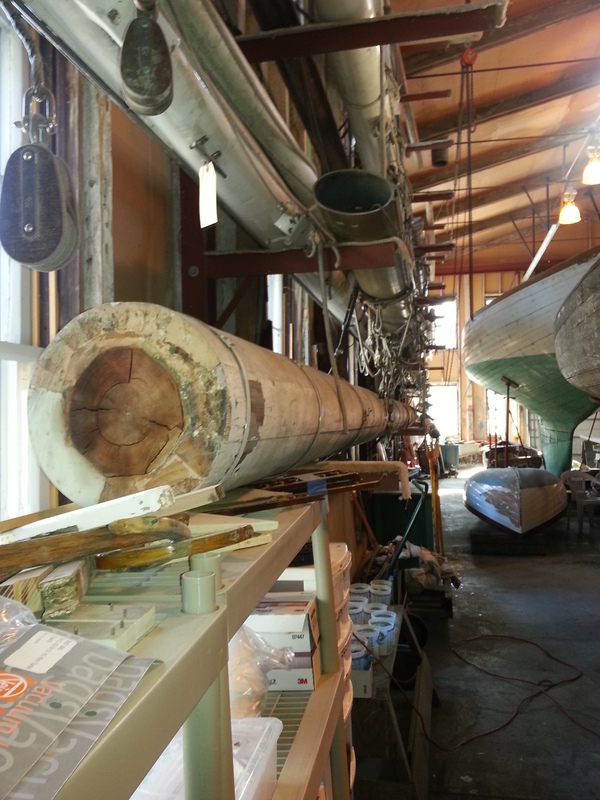 – Classic Yacht Symposium articles on building of masts and spars for restoration of NY50 SPARTAN. But first a disclaimer, I am not a naval architect nor a “big boat” sailor. I do make ship models of clippers, fishing schooners, and naval vessels as a hobby, have been in the aerospace business for a career, and am reader/ researcher with maritime interests. We have on our Reliance team, a retired long-time wood-worker, boat and spar builder who worked for a number of leading sailboat builders, so what we do is offer our observations, with the hope that those more intimate with these topics will pick up the threads of conversation to build on the Museum’s “kit” of exhibits. My first observation is that the Herreshoff brothers were evolutionary in many ways, much the way that Webb or McKay of clipper fame or leading Baltimore, Boston or Gloucester schooner designers were. To that end, each new boat contained some new element (usually a collaboration of designer/ builder, owner and captain) to gain advantage, yet so much of the design and manufacture remained traditional. Sort of a controlled and continual evolution/ experimentation. 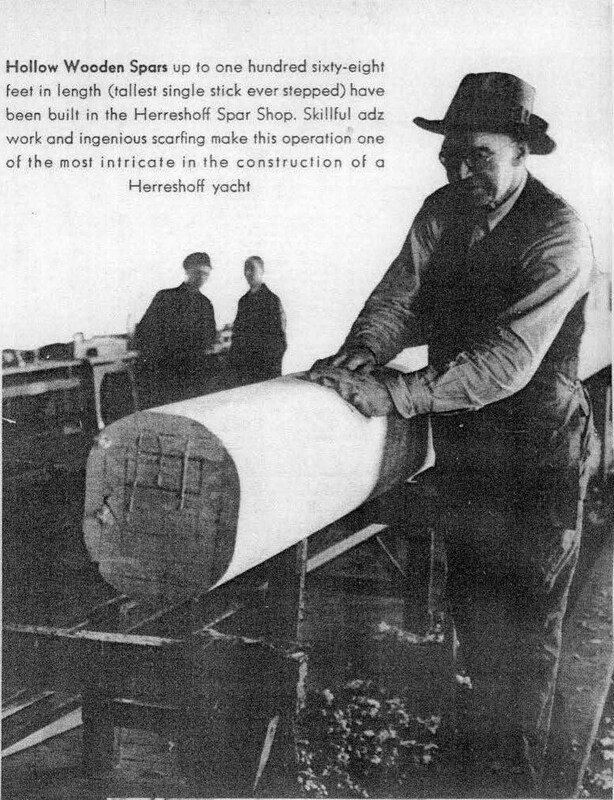 This observation is not to belittle the Herreshoff achievements, for HM Co. certainly pushed the edge of technology and extreme performance to a set of racing performance requirements; but to suggest how they optimized achievement of excellence. So, in clipper ships we see fished masts (though solid with many staves), fids, diagonal hull bracing, and even “Cunningham’s self-rolling topsails” in 1851, which I think of as much more modern development. (perhaps a reprisal of an old idea with modern technologies and materials and of course the required new name). In windjammers that evolved from clippers, we can see riveted metal hulled and steel masted ships from 1870’s to early 1900’s, and in naval vessels the use of Tobin Bronze. 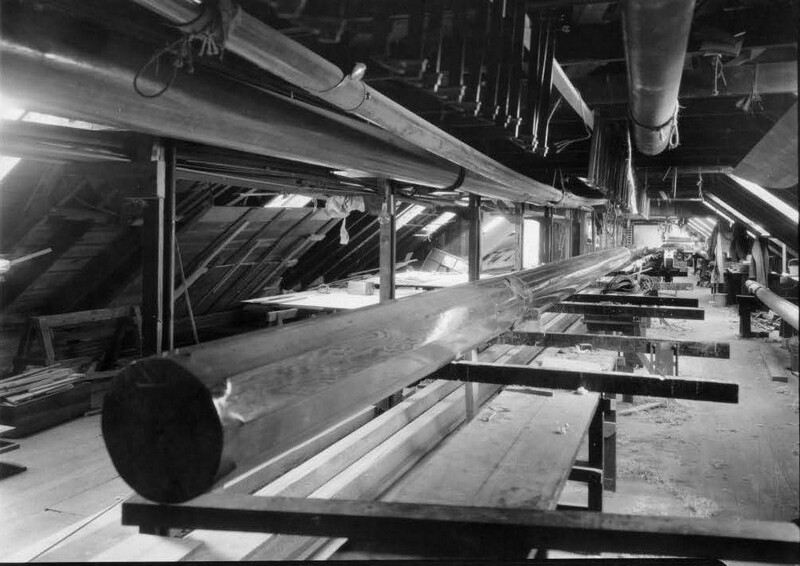 We can also wonder whether some of the Herreshoff use of riveted and brazed metal plating technology didn’t come from railroad engine boiler-making such as at Corliss where NGH worked. We also wonder whether other contemporary yacht builders had similar manufacturing and building techniques. Rig, names and fittings were common across big sailing ships and fishing schooners so perhaps it is no wonder that America’s Cup crews were sought from Maine to Scandinavia. 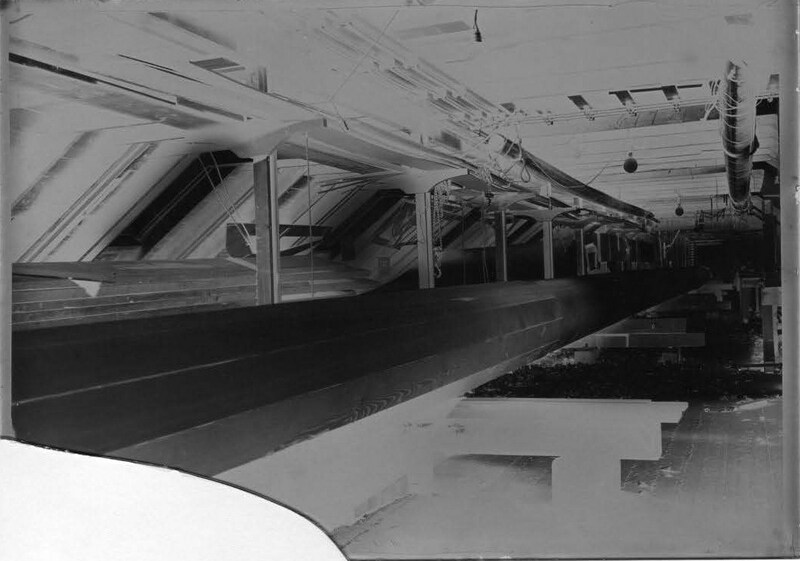 Also, when we look at the 24′ hull of 1892 WEE WINN which currently sits next to our 24′ RELIANCE hull looking like a twin sister, or when we look at the half hull models of COLUMBIA, CONSTITUTION and RELIANCE we think we can see the evolution from small to big and in each successive new boat. Our Reliance team when looking at drawings and pictures and then talking with experts and Herreshoff affectionatos often wonder whether our manufacturing and design questions are as much a generational question or discovery of lost art; whether a 1903 boat builder would so instinctively understand the missing elements of the drawings and construction requirements, and that if our question of wonderment could pass back through a time machine the question would be greeted with scorn for such a greenhorn question. 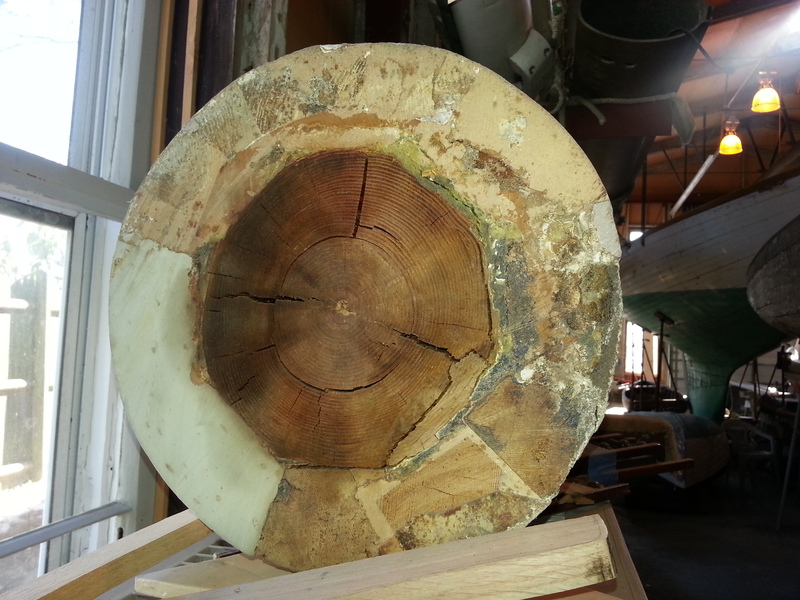 As for COLUMBIA’S topmast: most viewers of the mast comment how crude the insides look. I can only observe that for a long time is was a flag pole on Papposquash Pt. and until recently the Museum’s flag pole! (The metal bands were a flag pole addition.) As far as I can see, there are no internal bulkheads unlike the spar drawings for RELIANCE, but that would require more in-depth probing. 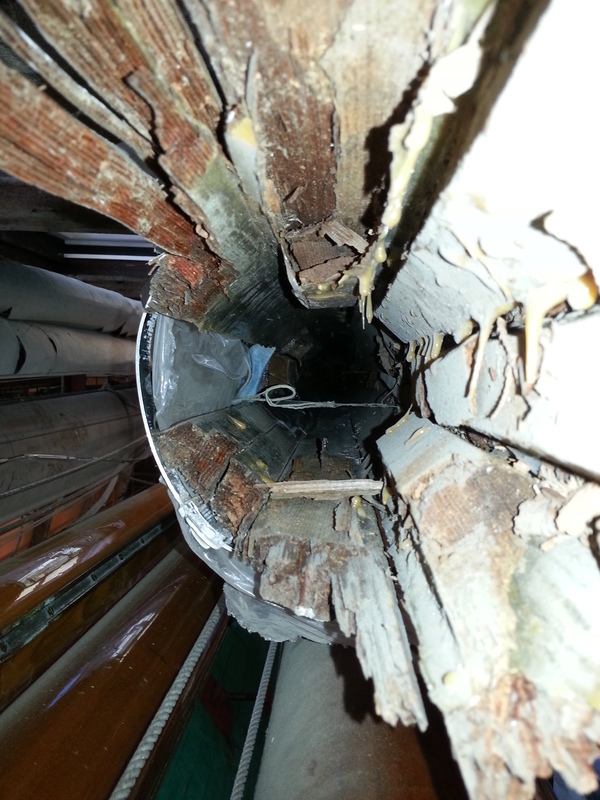 There do not appear to be sheave supports of fid hole at the base of the mast, but perhaps this area was cut off. 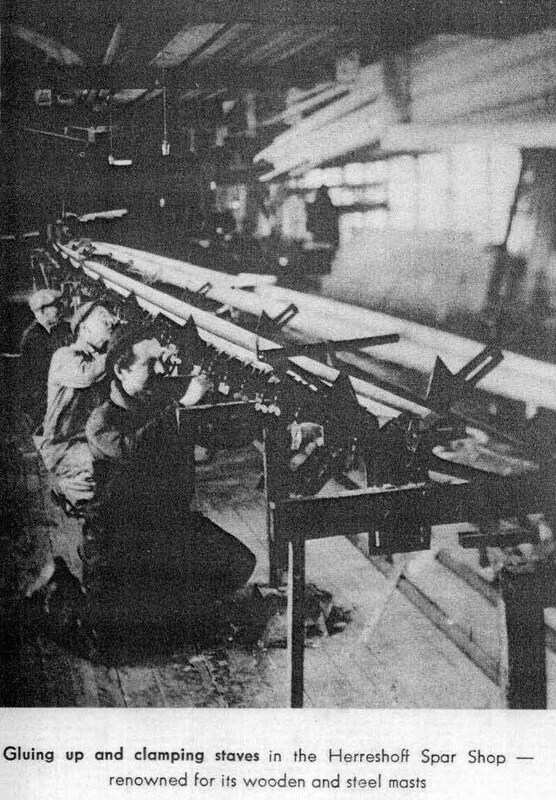 There is some internal bracing as can be seen in the pictures, but interestingly, these internal planks do not seem to be placed over the joints of the staves. 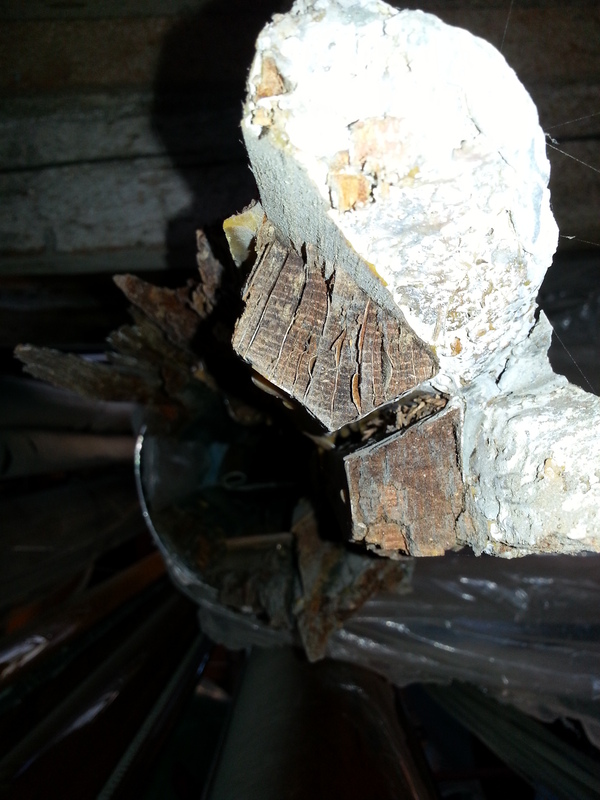 Perhaps they just reinforce scarf joints or a broken top? Again, more professional probing might offer insights. One observer commented that such internal bracing seemed very modern; that early aluminum masts and carbon fiber masts also had such bracing. As for the sketch of RELIANCE’S topmast which we blogged about earlier, we wonder whether that construction approach is more practical for a barrel of constant diameter such as this topmast rather than a tapered spar. We did think, as the authors of the Spartan spar article did that the wedges would offer a perfect depth gauge for rounding the spar. The Sandy Hook series (where the Cup races will be held) is cut short by fog to one race won by Reliance. Then on June 17 while racing off Larchmont the topmast carries away. A replacement is sent that day from Herreshoff by tug to Fall River where a Fall River Line freight steamer picks it up for overnight delivery to City Island. Reliance is racing again on June 19. During these races Constitution breaks two topmasts and Reliance one. With the cause of the Reliance failure determined (bunged fid did not properly insert; fix a lighter topmast to reduce loads on fid) a new 23% lighter mast is designed and installed. This solves the problem. 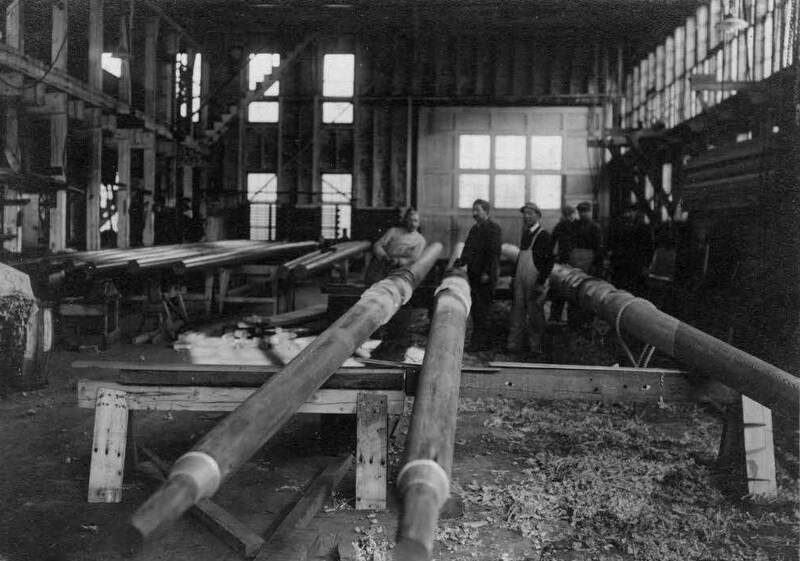 According to these tables Sitka is 15-20% lighter than douglas fir, but Herreshoff was probably using old growth wood, not modern. Not sure what impact the relative strength ratios had. a. both were 58′ long with straight 13″ dia. round barrels. b. Both were hollowed out: hollowed 7″ dia in the 25′ mid-section and tapered to 9″ dia for top 22’6″ on 2nd design while 1st design was hollowed 7 1/2″ mid-section and tapered to 9 1/2″dia. 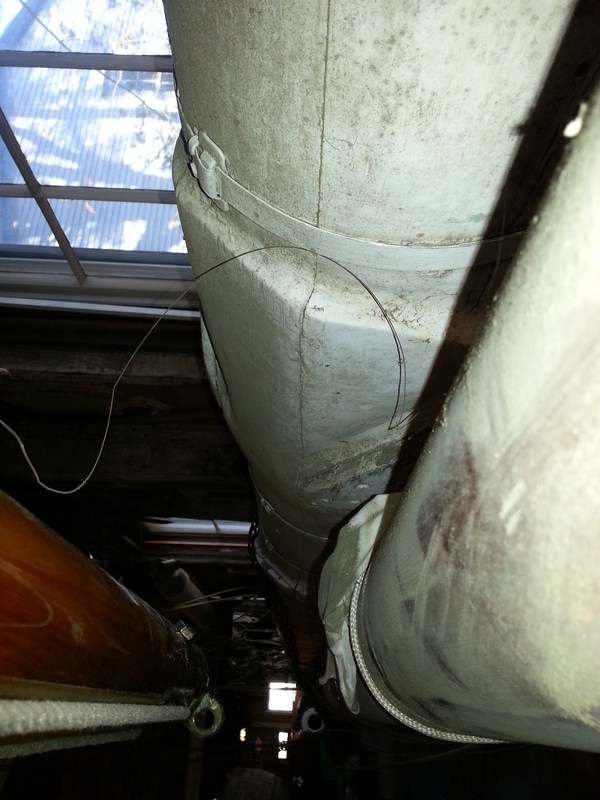 hollow for top 22′ 0″. Since the radius cut for the hollow at mast base for the first design was 4 3/4″, the hollow bottom tapered from 9 1/2″ to 7 1/2″ before the masthead bearing ring. The second design started with a 9″ hollowed dia. 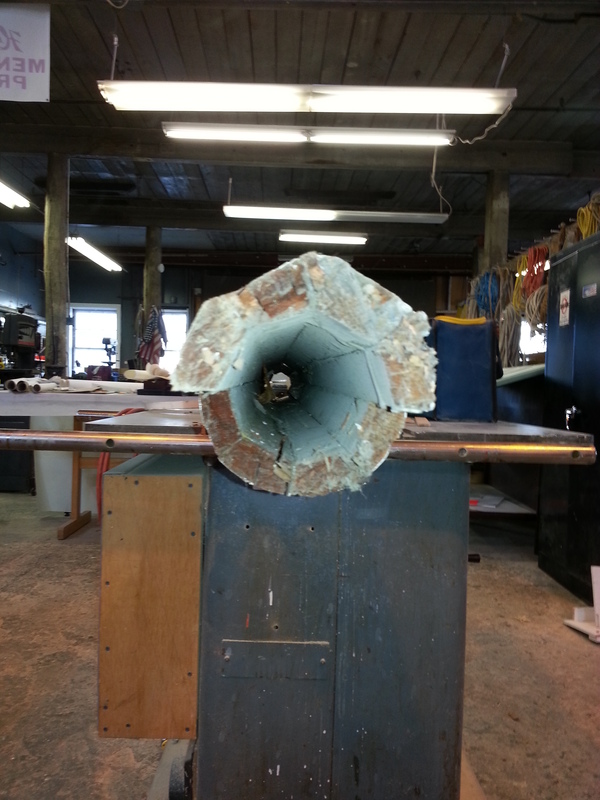 at the base tapering down to 7″ dia hollow before reaching the masthead bearing ring. d. The first design mentions eight 1 3/8″ thick bulkheads spaced 5′ 10 1/2″ apart. The second design does not mention bulkheads, except showing one at the masthead bearing ring. 3. Per HM Co. drawings, Capt. 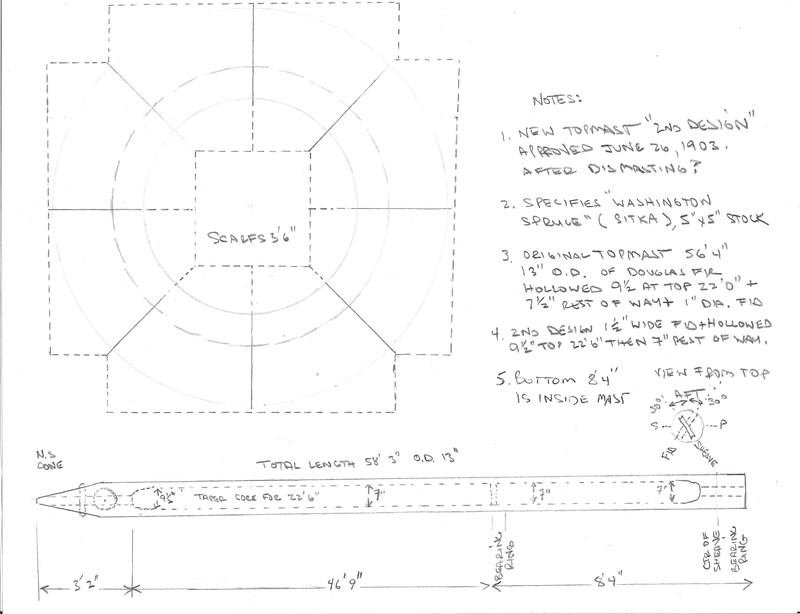 Nat approved the 2nd topmast design on June 26th, so the June 17th shipment of a topmast must have been a spare (refer to earlier blog comment about spare spars and masts) with the Sitka spar arriving early July. As you can see, building the RELIANCE model is as much a voyage of discovery as construction of the model. We hope to leverage insights from our “interest group.” Comments? Observations? 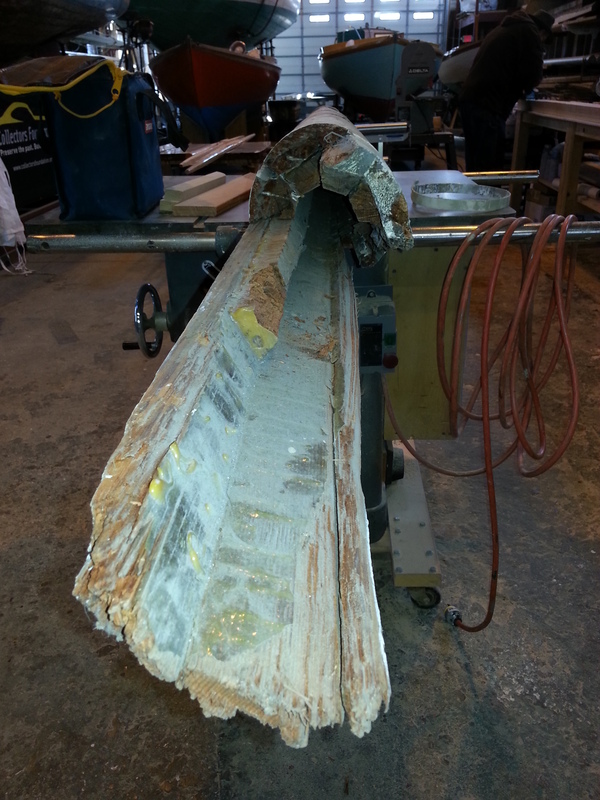 This entry was posted in Builder's Notes & Pictures on February 1, 2013 by Herreshoff Marine Museum/America's Cup Hall of Fame.